If you think that you are familiar with this artist’s work, you are in for quite a wonderful suprise! Singer/songwriter Serah has brought together musicians and artists from several continents, as her crystal-clear vocals unite with the harmonies of African voices to create a stirring and exhilarating musical milestone. With the tears of a love that is true….. If you can hear me I ask. Will you hear me at last? But the shadow’s my own. And all the tears were not what they seem. Find their fullness in you. Is this something you knew? Mon sumela soray, yambulma fatay…..
And sing with the words and the tune? 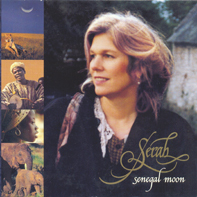 From the curve of the Senegal moon? Is it too soon to understand? When I’m in a far off land? As he travels the winds of Soul? And all of the stories I told? When the river gave back her light? And birds sang through the heat of the night? And remember when we walked in Dordogne? Till we’ve learned the great Design? And music replaces time ? It’s the light in you. Listening down on her knees.